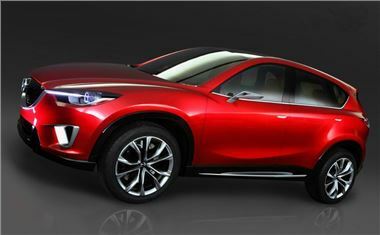 Mazda has announced that it is to introduce a new compact crossover SUV called the CX-5 in 2012. Mazda has announced that it will introduce a new compact crossover SUV called the CX-5 to the UK in 2012, based on the Minagi concept, pictured. The CX-5 will be the first production car based on Mazda’s new ‘KODO – Soul of Motion’design language that was first premiered on the SHINARI concept in 2010. The CX-5 will also feature the latest Mazda SKYACTIV technology, with new generation engines, transmissions and engineering. The CX designation, already used on the current CX-7, is Mazda’s official designation for crossover SUVs. The production model will debut this year at the Frankfurt International Motor Show in September. It will then go on sale in the UK in 2012.